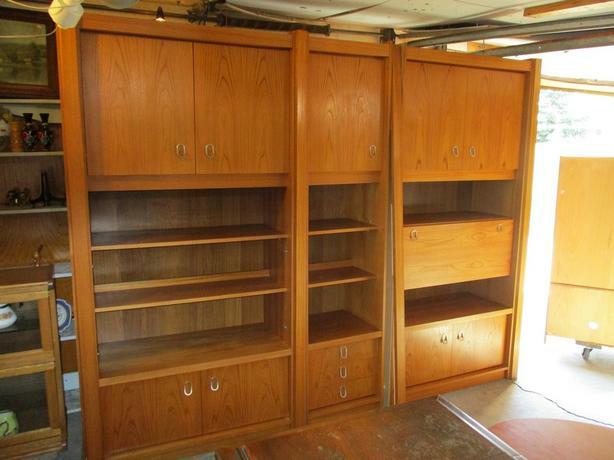 AUNTS 1981 ESTATE TEAK MULTI PURPOSE OFFICE/BOOKSHELF/BAR/CABINET IS 106 INCHES WIDE, 19 INCHES DEEP AND 83 INCHES HIGH. THIS UNIT IS MADE UP FROM THREE DISTINCT PIECES STANDING SIDE BY SIDE. EACH PIECE IS HELD TOGETHER BY SPECIAL BOLTS DESIGHNED BY THE DANISH MANUFACTURERS. WHEN JOINED THE FRONT JOINTS AND THE RIGHT AND LEFT ENDS ARE COVERED BY GROOVED VERTICAL TEAK BOARDS THAT HIDE THE JOINTS AND PRESENT AN ARTISTIC DURABLE APPEARANCE. THE TWO OUTER SECTIONS ARE WIDER THAN THE CENTER SECTION BUT THEY ARE EQUAL IN WIDTH GIVING A BALANCED APPEARANCE TO THE WHOLE UNIT. THE ENTIRE CABINET SITS FLAT TO THE FLOOR. THE FAR LEFT SECTION HAS TWO TOP DOORS COVERING TWO SPACIOUS SHELVES. BELOW THESE DOORS ARE 3 DEEP SHELVES. BELOW THESE SHELVES ARE TWO DOORS COVERING STORAGE SPACE. THE CENTER NARROWER SECTION HAS A TOP DOOR COVERING 2 SHELVES. BELOW THAT DOOR ARE 3 SHELVES. BELOW THOSE SHELVES ARE 3 EQUAL SIZE DRAWERS. THE FAR RIGHT SECTION HAS 2 TOP DOORS. THEY COVER TWO SPACIOUS SHELVES. BELOW THE DOORS IS A FULL WIDTH OPEN SHELF. BELOW THAT SHELF IS A DOOR THAT PULLS FOREWARD AND DOWN REVEALING A LIQUOR CUPBOARD. THERE IS AMPLE STORAGE AREA INSIDE THIS CUPBOARD. BENEATH THE LIQUOR CABINET IS AN OPEN SHELF. BENEATH THE OPEN SHELF ARE TWO DOORS COVERING STORAGE AREA. THIS WHOLE UNIT IS IN NEAR STORELIKE CONDITION AND READY TO USE. FROM A NONPET, NONSMOKING HOME.